The patient came in complaining of stomach pains. She was clearly in distress, and nervous, but alert. The team of doctors around her bed calmly and quickly got to work. One took her hand and assured her they would get to the bottom of her pain. Another began a physical examination. Another asked about her family history, her lifestyle, and what she’d recently eaten. It was chaotic, as all emergency rooms are, but the chaos was controlled, and had the feel of a well-oiled machine. Just six weeks earlier, the same group stood uneasily around a different patient — this one complaining of difficulty breathing. The only sounds were the beeping of a heart monitor, the patient’s labored breathing, and awkward, confused, and nervous laughter from her attendants. The thing is, these “doctors” weren’t actual doctors, but students from the Urban Science Academy, an open and inclusive STEM (science, technology, engineering, and mathematics) high school that is part of Boston Public Schools. 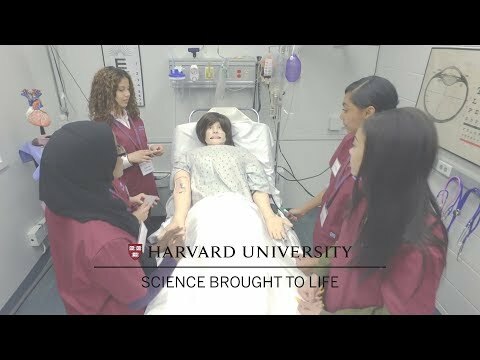 The students were visiting Harvard Medical School to take part in the HMS MEDscience program, a STEM initiative aimed at inspiring students and engaging them in science through hands-on experiences. 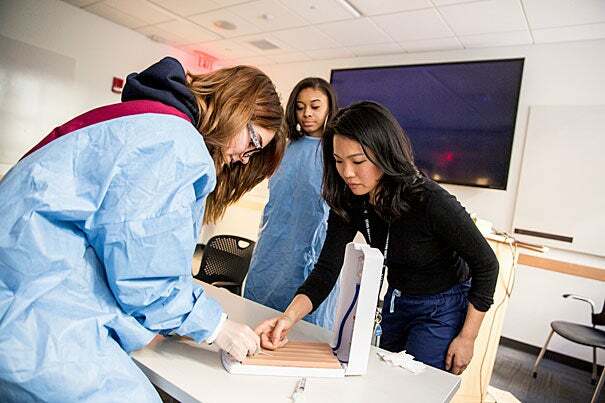 The program, which launched in 2005 and is currently in 11 Boston schools, is a semester-long high school biology curriculum focused on the anatomy and physiology of seven human organ systems. Each school’s science teacher integrates a MEDscience-designed curriculum into his or her classroom instruction. 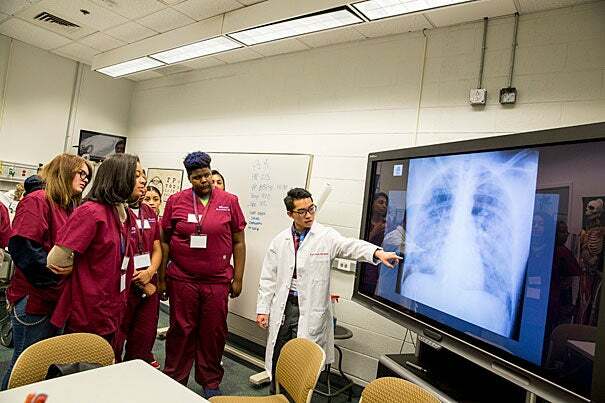 Once a week, the class travels to the MEDscience Simulation Lab at HMS to apply classroom learning to patient care. The chance at hands-on learning is what draws many students to the class, and what keeps them coming back for more. 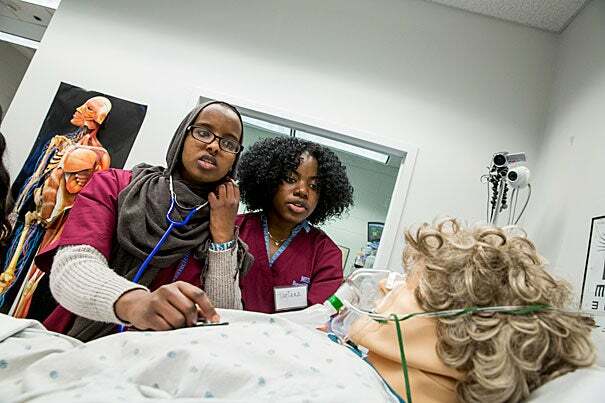 Educators often find that students who learn through simulation are able to deepen their understanding of an issue by connecting it to real-life experience. Many of the students agree. Joyal says the program is also committed to trying to close gaps in opportunity, achievement, and inspiration by driving home the message that STEM-based careers are open to all. It seems to be resonating. A recent study found that 63 percent of students who participated in the program took additional science or health courses, and 97 percent went on to college. While opening the door to STEM fields is a large component of the program, it’s far from the only MEDscience takeaway. The program also stresses the importance of critical thinking, leadership, problem solving, and teamwork — “all 21st-century skills that employers want, and skills that make kids successful in their careers,” said Joyal. Partner schools say the program has become a critical learning tool for their students. Tim DiMario, a teacher at Urban Science, has been participating in MEDscience for three years. Oriol said that from the very beginning of the program, 12 years ago, the effect on students has been clear to see. DiMario has seen the same types of transformations. The program serves hundreds of students every semester. Both Joyal and Oriol said they hope to expand into more Boston schools, move on to Cambridge, and eventually partner with other medical schools across the country. Every semester brings new success stories. One of the most memorable for Oriol and Joyal is that of Justin Owumi, a student in one of their very first classes who now volunteers with the program. Last month, Owumi finished up his first year at Tufts University School of Medicine. When a Cambridge Rindge and Latin student learned that Louisiana’s marshes (pictured) were becoming increasingly fragile, he wondered about local marshes, too. That set Owen Ryerson on a new path — straight to a marine biology internship program.